My brother-in-law always teases me about “temping” food. I’ve never heard it called that, but what he loves to joke about is my use of a thermometer when I’m cooking. It’s true — I can’t resist “temping.” I even use my thermometer when I’m cooking on the grill. Yes, there are lots of ways to judge doneness, but they’re not equally effective. I know that many people use the meat’s color as their guide, but you can’t really rely on meat’s appearance to tell whether it’s done. The color of cooked ground beef can be quite variable. 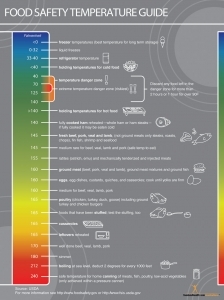 At 160 degree Fahrenheit (F), a safely-cooked patty may look brown, pink, or somewhere in-between. When a patty is cooked to 160 degrees F throughout, it can be safe and juicy, regardless of color. Well, recently I was cooking burgers on the grill and using their appearance as my guide to “doneness.” Honestly, I thought they needed more time. I pulled out my thermometer to check, and I found that the burgers had already surpassed the recommended 160 degrees F. I could have easily overcooked those burgers! Anyway, the moral of the story is that, when it comes to cooking meat, you can’t always tell doneness by the color. 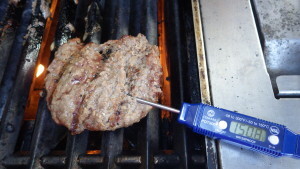 The only way to be sure a ground beef patty is cooked to a high enough temperature to destroy any harmful bacteria that may cause a foodborne illness is to use an accurate instant-read thermometer. 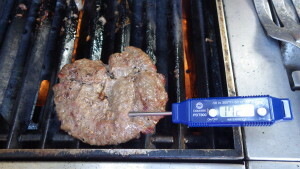 For ground meat patties, insert the thermometer at least ½ inch into the thickest part of the patty near the end of the cooking time. 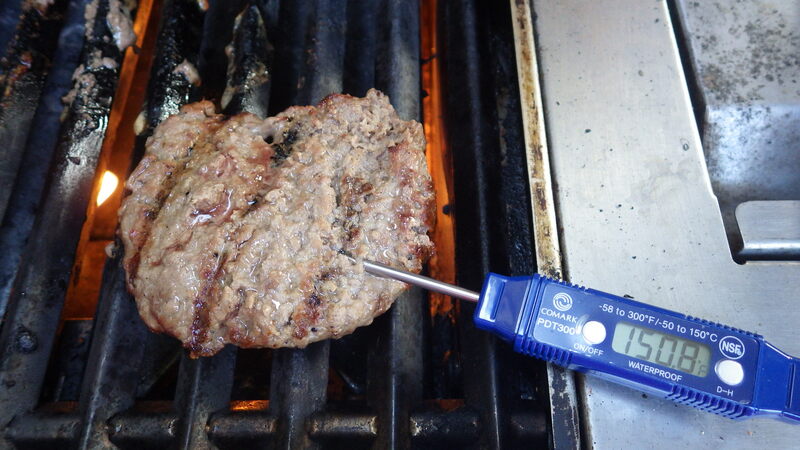 If the burger is not thick enough to check from the top, the thermometer should be inserted sideways. If you’re not sure if you got into the center, you can take a second reading in a different part of the burger. All ground beef, veal, lamb or pork patties should be cooked to 160 degrees F. If you’re making a ground turkey or chicken burger, ensure that the patty reaches 165 degrees F.
I know lots of people will disagree with this. How many times have I heard people insist that they like their beef burgers rare or cooked below 160 degrees F? This is a personal choice that you can make, but know that you are putting your own health at risk when you eat those burgers. You’re also endangering anyone else who might eat one of your undercooked creations. I especially don’t consider this an acceptable option for poultry burgers. Rare hamburgers are far riskier to your health than a rare steak. If any pathogens are present on the outside of a whole piece of meat — like a steak — the high heat that sears and cooks the outside will destroy the dangerous bacteria. But when meat is ground up, any bacteria on the surface are mixed throughout the meat. Therefore, heat needs to get all the way into the middle of the burger to destroy these harmful bacteria. The real concern here is a foodborne bacteria commonly known as E. coli. This bacteria and the illness it causes have been linked to the consumption of undercooked ground beef. 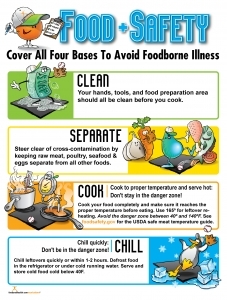 Don’t let E. coli stay in your food — cook it out! Oh, and here’s a special word of caution: while a healthy adult may not feel the effects of an undercooked burger, guests or other family members may be more at risk. The very young, the very old, and those with immune systems that have been weakened by cancer, kidney disease, and other illnesses are the most vulnerable to sicknesses associated with contaminated food. This is especially true with E. coli. These bacteria have been known to cause long-term illnesses including potentially fatal kidney failure. 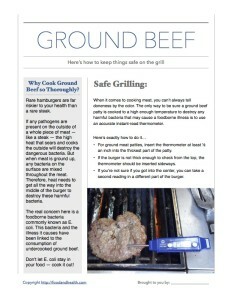 Here is a free step-by-step food safety handout for grilling ground beef. 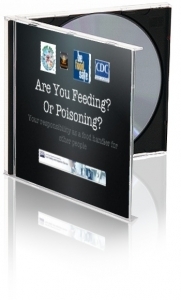 There are lots of food safety resources in the Nutrition Education Store!